A player from Finland hit the Bad Beat Jackpot of $1,831,426 (€1,265,583) at Poker Heaven, one of the poker rooms on GTECH G2's International Poker Network. His share of the record-breaking jackpot was $640,696 (€442,954). 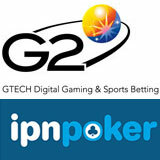 This sets a new IPN Bad Beat Jackpot world record, breaking the previous world record of approximately $1.2 million. The new Jackpot has already started at over $360,000 – remaining the largest Bad Beat Jackpot in online poker. The player known as OmgoMgomGo, the loser of the hand (with Quad Kings) but the winner of the record breaking Bad Beat Jackpot, received $640,696 (€442,954). Hand winner with Quad Aces, 7Adelaida7, won $320,391 (€221,477). The other 7 players in the hand all received $45,766 each (€31,639) for participating in the hand.